Figure 1 The ‘Mother of All Markers’ in Kingsville near Point Pelee. G0 check it out. [or see above] It shows a mature, roadside White Elm (Ulmus americana) on the Haldimand Clay Plain near Thorold with its side branches pulled down, the trunk and main branches drawing the shape of an ‘M’, the lateral branches forming the crown. Aboriginals had purposefully modified the tree at one time — early to mid 1800s, I would guess - to point along an ancient footpath. The tree was well known in the community, ravaged by Dutch Elm Disease in the early 70s, but saved as a snag until a Windstorm brought it down December 28, 1982. Wow, I thought, dumbfounded and flooded with questions. Where do I find out more about Indian trail marker trees? Are there more photos of tree markers I could find? Are there marker trees standing on the landscape of Southern Ontario today? My first couple of questions would be answered with a little more surfing. I came across two links about trail marker trees, both from the United States. The first one is run by the Mountain Stewards (mountainstewards.org) of the Southern Appalachians, the second, a link to the Great Lakes Trail Marker Tree Society (greatlakestrailtreesociety.org) run by artist and trail marker tree researcher, Dennis Downes* from Illinois. Both sites show numerous photos of trail marker trees standing in the US today, but most of them didn’t look like the Old Indian Trail Marker Tree in Thorold. Most were modified to point in one direction and, not surprisingly in the US, most of them were oak. Downes’ site dug deeper into the background on how marker trees were formed and provided tips on what constitutes a true trail marker tree (apparently, there is some debate over what constitutes a true marker as there are a lot of bad examples out there - folks calling any old misshapen tree a trail marker). True markers were modified near the ground. A sapling was bent over and its leader was tied down with rawhide, grapevine or secured with heavy rocks. The lateral branch pointing directly upwards was retained while the rest were removed. Over time the tree settled into the bend, the rawhide was removed or withered away, and a ‘nose’ was often left to point the way. 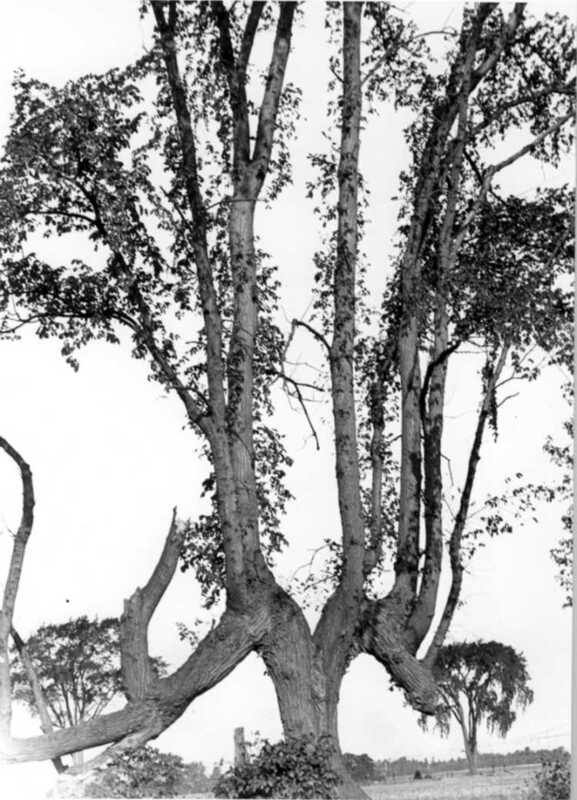 As the tree grew, the diameter of the main trunk remained larger than the lateral branch forming the crown. Other trees, like the branches on the Thorold marker, were just pulled down and secured. Either way, marker trees were meant to look very purposeful, distinguishing them from naturally bent trees. I learned that marker trees were used by Aboriginals to point to all kinds of things: villages and camps, water sources and river fords, or to mark boundaries between Aboriginal tribes. It is thought that the practice of marking trees was taught to the first Europeans, and it is plausible that they and not the Aboriginals formed some of the markers remaining on today’s landscape. Apparently, trail marker trees were common in pre-settlement times, most now lost to habitat destruction and the practice of removing ill-formed trees in woodlots. Kawarthas. This one has two ascending trunks and a prominent pointer. My quest to find marker trees in Southern Ontario led me to spend a winter revisiting my old haunts in Hamilton, Halton and Niagara Regions to no avail. It was only when I started asking friends and fellow botanists that I started to get somewhere. None of them really knew about marker trees before. I just shared what little I had discovered and for some, a little light bulb went on above their heads as they recounted seeing a similar looking tree at such and such place. Some of the leads were dead ends, but some led me to the most magical trees I have ever seen. A friend told me about seeing markers at her partner's cottage in the Kawarthas (see photo). Another told me about a tree in a Caledonia hedgerow. I learned of a grafted, double-trunked Sugar Maple that stood in Binbrook along the Welland River, believed to be a boundary marker between Iroquoian tribes (that is, until some kids started a fire under it 10 years ago and burnt it to the ground). This past summer, my friend and tree colleague, Gerry Waldron, showed me a couple of amazing marker trees in Windsor-Essex (see photos). One of them is the most impressive tree I have seen (online or in person) to this day. And last fall I stumbled across a couples of Sugar Maple less than 100 m apart (see photo) in north Burlington pointing in the same direction along a path from the Niagara Escarpment to Lake Ontario - the only marker trees I have discovered on my own thus far. Perhaps early colonists to Southern Ontario modified the smaller trees, but it is thought that, because of the bends, the growth on marker trees is slow and the trees are older than they look. What is clear is that marker trees exist in Southern Ontario, and marking trees was an ingenious practice employed by the Anishinabe (Ojibway) and Haudenosaunee (Iroquois) Peoples of Southern Ontario. There is something so beautiful, sophisticated, and poetic about trail marker trees. It is incredible to think in this age of frenzied, electronic communication, that living‘, natural messages so simple and practical are still standing on the landscape today — a centuries old tap on the shoulder pointing us the way home. Reaching back to a time before the car, before roads and lights, when sticking to the forest trail was crucial to survival, and a wrong turn could spell danger or death. For these reasons, I would argue that our oldest trail marker trees are the most historically important trees in Ontario today. I am continuing my search to find and document more trees, seeing it as a project with a 10 or 20-year horizon. Yes, researching and Walking old Aboriginal trails is helpful, but again, I have found the best way to find out more about these special trees is just to ask around. Therefore, I am appealing to the FBO membership: Do you know of a trail marker tree where you live? In your wanderings, do you remember seeing trees like these? Do you know of a marker tree that once stood where you live, a document describing it, or someone who may know of a marker tree in your area? If so, I would be very pleased to talk to you by phone or email, please and thank you. I just learned of a trail marker tree that was chopped down this year, unknowingly, by a property owner along the shoreline of Lake Erie at Port Dover. Once dead, or removed, we lose their untold stories, stories that tell us about who we are and where we come from, stories we can share with future generations about this very special land, and the incredible people that walked and marked its forest paths. * Dennis Downes’ new book Native American Trail Marker Trees: Marking Paths Through the Wilderness is available from the Great Lakes Trail Marker Tree Society at www.greatlakestrailtreesociety.org. It is the first comprehensive book on trail marker trees ever published. Wow, these tree are amazing I've never seen anything like this..so amazing. Thanks for sharing! Hello, I have been interested in this tree trail topic for a few years now. A few years ago I started doing internet research about my home town of Greensville and the surrounding area. I grew up on the 4th concession in Flamborough between Townline Rd.was(Middletown Line). I had never hear of such a thing before. I mean my dad found a arrowhead out hunting near our house one day. I did a little digging to find out what tribes were in the area. So I came across someone writing about how I think they found one near the Beverly Swamp. Then ever since I have been keeping my eye out. Thanks for sharing such a nice blog. I thought I was the only one. I am very familiar with the photos of the trails and areas in Dundas you have posted. Beautiful photos. Do you belong to a club or group that is interested in this topic?I have a blog too. Maybe I will write about my tree experiences there! !Thanks for inspiring me. I finally wrote about it in my blog.